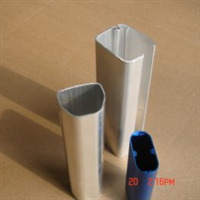 The company specializes in processing of various aluminium products. It covers an area of more than 30000 square meters, owning two extrusion machine of 650t and 1000t, a oxidation workshop and a processing workshop. The company boasts complete production technology of mould production, profile extrusion, oxidation&coloring, sanding, polishing, dustless spray painting, static powder spraying, downstream processing of aluminium profiles, etc. The company is capable of import and export, marketing its products all the way to Europe and America, etc.